Richard Ross uses a camera. He takes on any task the camera requires of him. His most recent interest draws him to the documentation of places where people take shelter from the madness that they rain upon one another. He has recently photographed bomb shelters in the US, China, Russia, England, Switzerland, Vietnam, Turkey and Israel. In this sense, he is among the oddest of landscape photographers, working primarily underground. Ross is also principal photographer for the Getty Museum and their Villa Project. His documentary projects of the former Getty site have been exhibited at the J. Paul Getty Center in Los Angeles. He has also served as the principal photographer for the Getty Conservation Institute, documenting their work in China, Tunisia, El Salvador, Honduras and other global restoration sites. Ross also does editorial work for the New York Times, Los Angeles Times, San Francisco Examiner, Vogue, Frankfurter Allgemaine, La Repubblica, Architectural Digest, etc. 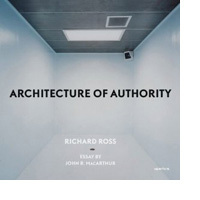 His previous publications include Waiting For the End of the World, Princeton Architectural Press. Museology (Aperture Press), Gathering Light (University of New Mexico Press) and Giverny and Natural History (Stuart Tabori and Chang).